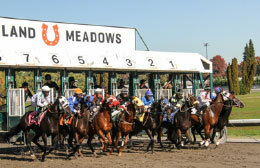 the Far West Futurity worth $32,300 will head Sunday's triple-feature stakes card at Portland Meadows. PORTLAND, OR—NOVEMBER 3, 2018—A triple feature of race action this Sunday at Portland Meadows will include one of the top Quarter Horse dashes of the season at 350 yards in the Far West Futurity worth $32,300 for two-year-olds that have qualified. GC Harrys Game sports the colors for owner Connie Chumbley after turning in the best time for the trials to qualify for the Far West Futurity. Trained by Scott Raley, the young son of Carters Cartel and Jockey Robert Burney stopped the clock in a time of :18:05 over a fast track in the trials. After good efforts at Sun Downs and Grants Pass, GC Harrys Game made his Portland debut a winning one in the Far West Futurity Trials. Ima Five Bar Cartel, a gelding by leading first-crop sire Five Bar Cartel was right at the neck at the wire in the day’s fastest time for the trials and looms the main threat under Eduardo Sosa for Trainer Hector Magallanes. The Far West Futurity will be the fourth race of the day. * * * * * * * * The sixth race on the card will be the Detroit Lake Stakes at five and one half furlongs for two year olds. A field of seven lightly tested two year olds step into stakes company for the first time with several coming off a maiden victory. The ninth race of the day will be the $10,000 Mt St. Helens Handicap at six furlongs. Aaron Bresko’s Copy Begone picks up an extra pound for the sprint contest as the Multnomah Falls winner looks to pick off her 16th career victory in the Mt. St. Helens. Portland Meadows will host "Angels On Wheels" Sunday as fans will be asked to bring a newly unwrapped toy to benefit the kids at Randall Children’s Hospital. Post time is 12 noon Pacific.